Christmas is almost here. Let’s celebrate! 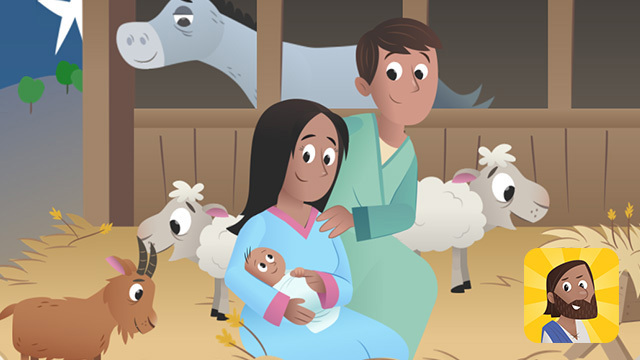 Celebrate Jesus’ arrival with fun, touch-activated animations and colorful artwork. The children in your life will love exploring all 41 stories in the Bible App for Kids. You’ll love how the activities Story Mixup, Story Memory Match, and Story Sticker Time help them remember the things they’re learning. YouVersion developed the Bible App for Kids in partnership with OneHope to give children a Bible experience all their own. Already installed on more than 14 million devices worldwide, the Bible App for Kids is available in 25 languages — and it’s always completely free. Each dot indicates one person opening the Bible App — which now happens an average of 125 times every second! 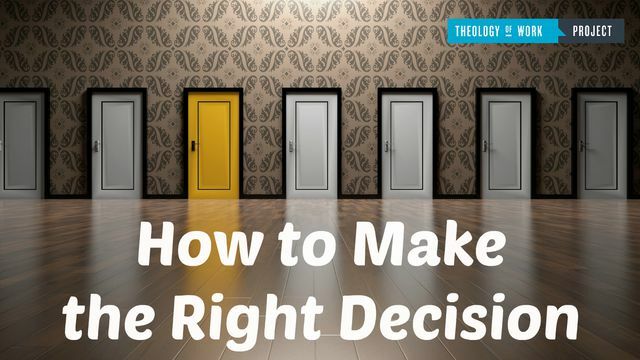 Don’t miss out on what God does next. When YouVersion launched as a website in 2007, we offered just 12 Bibles, in two languages. This year, thanks to the generosity of visionary partners, the Bible App became the first app in history to offer text content in over 1,000 languages. All over the world, more and more people are turning to the Bible to hear what God wants to say to them. 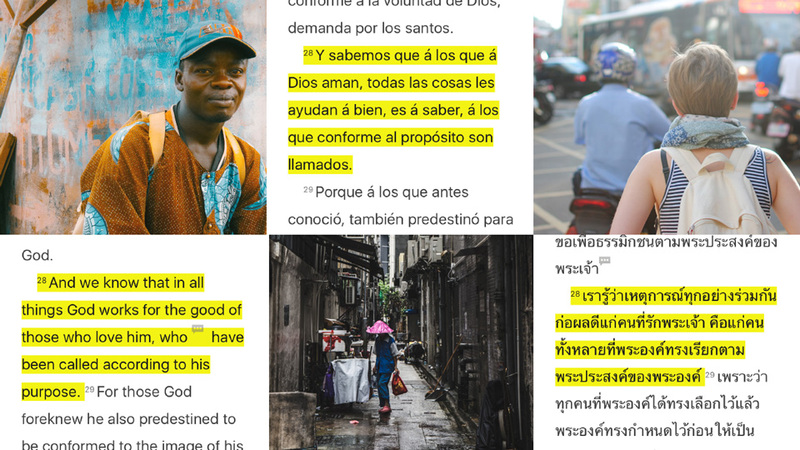 When you give to YouVersion, you’re helping us connect them with God’s Word, in every country on earth. 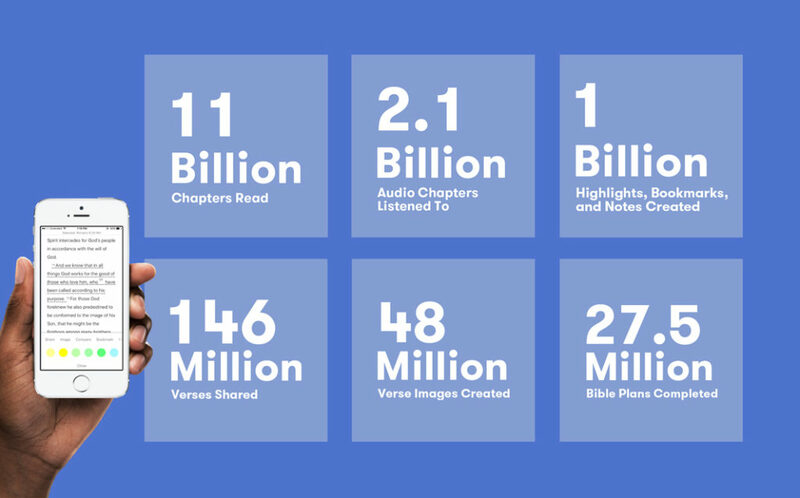 2016 was the worldwide YouVersion community’s most Bible-engaged year ever. 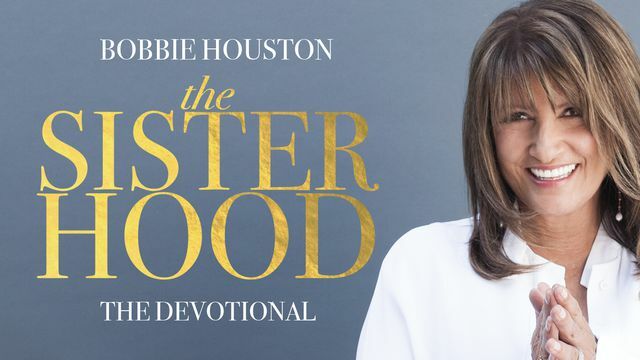 At YouVersion, each one of us has experienced the gift of God’s love through his Word. That’s why we’re so passionate about sharing the Bible App with as many people as we can. And because you use the Bible App, you’re already a part of what God is doing. Every time you use the Bible App — whether it’s to read, to listen, to meditate, or to share — you’re participating in a community that spans the globe. Now, take the next step in your Bible App journey: discover how much better it can be to give than to receive (Acts 20:35). We’re leveraging technology to equip this generation to be the most Bible-engaged people in history. That’s because we believe that when you invest in reading or listening to Scripture, it has the power to change your life. We’re seeing it happen all over the world. 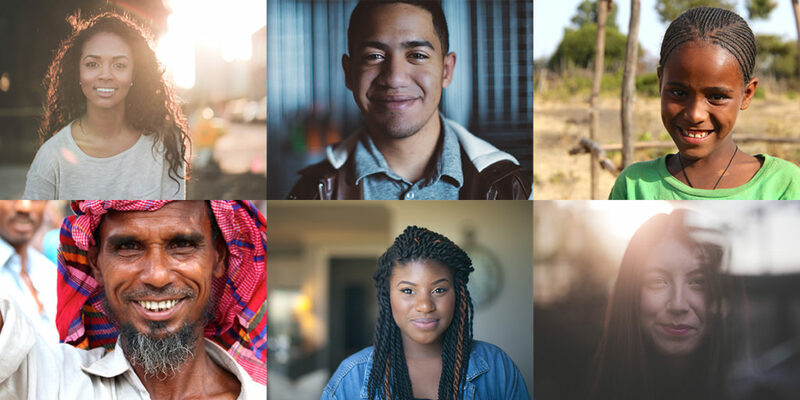 When you give to YouVersion, you help us connect more people with God’s Word, in places that have seen triple-digit Bible engagement growth like Mozambique, Nepal, Bangladesh, Argentina, Cameroon, Indonesia, and Iraq. 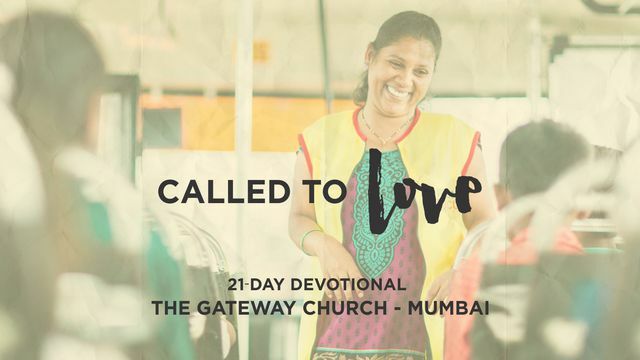 Imagine a world where every person can instantly engage with God’s Word in their own language. In the history of our planet, nothing like that has ever been possible before. But now, not only is this dream possible, it’s within reach — and during our lifetimes. 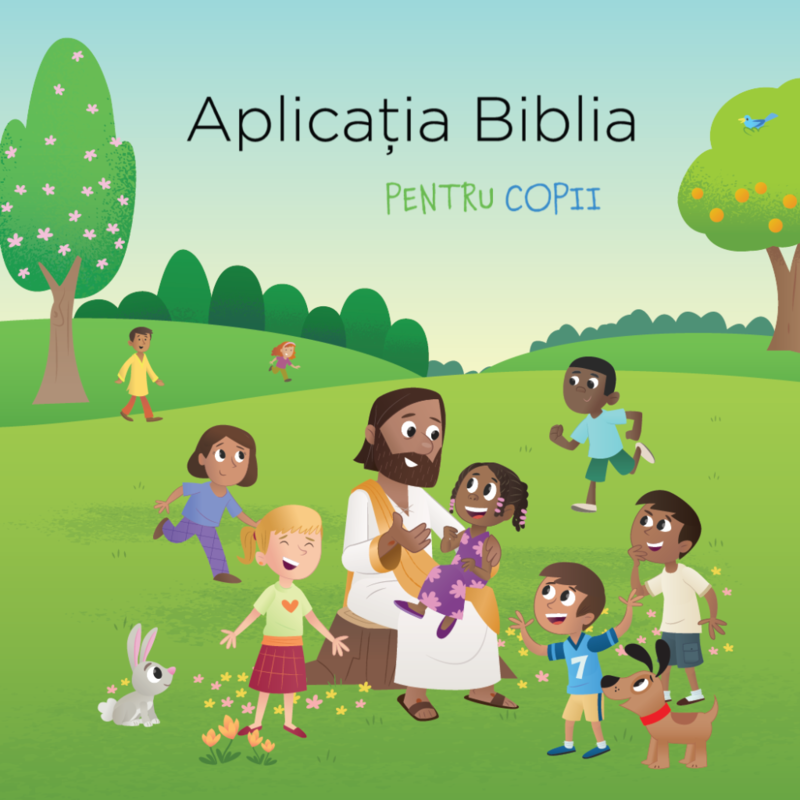 Now Your Children Can Experience the Bible App for Kids in Romanian! Today, together with our partner OneHope, we are pleased to announce the launch of the Bible App for Kids in Romanian. Now, more children than ever have the opportunity to enjoy a Bible experience all their own. Switching between languages is easy, right in the app’s Settings. Just make sure you’ve updated your app to the most current release, then look under Settings for “Language.” Choose between Afrikaans, Arabic, Brazilian Portuguese, Chinese (Mandarin audio with either Simplified or Traditional characters), Dutch, English (UK or US), Farsi, Filipino (Tagalog), French, German, Hindi, Indonesian, Italian, Japanese, Korean, Romanian, Russian, Spanish, Thai, Turkish, Urdu, and Vietnamese. The audio will play in that language, and any text will appear in that language, too! The Bible App for Kids is from YouVersion, makers of the Bible App, designed to give children a delight-filled Bible experience all their own. 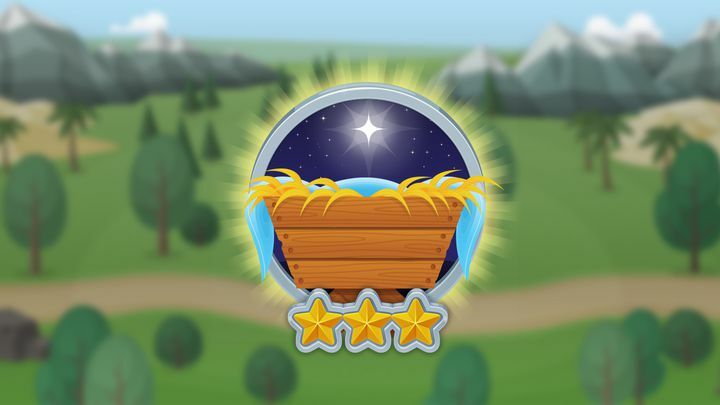 Developed in partnership with OneHope, the Bible App for Kids has already been installed on more than 13 million Apple, Android, and Kindle devices, and it’s always completely free. Kids from all over the world are now enjoying the Bible App for Kids — in Afrikaans, Arabic, Brazilian Portuguese, Chinese (Mandarin audio with either Simplified or Traditional characters), Dutch, English (UK or US), Farsi, Filipino (Tagalog), French, German, Hindi, Indonesian, Italian, Japanese, Korean, Russian, Spanish, Thai, Turkish, Urdu, Vietnamese, and now… in Romanian! Your biggest year ever. Again. 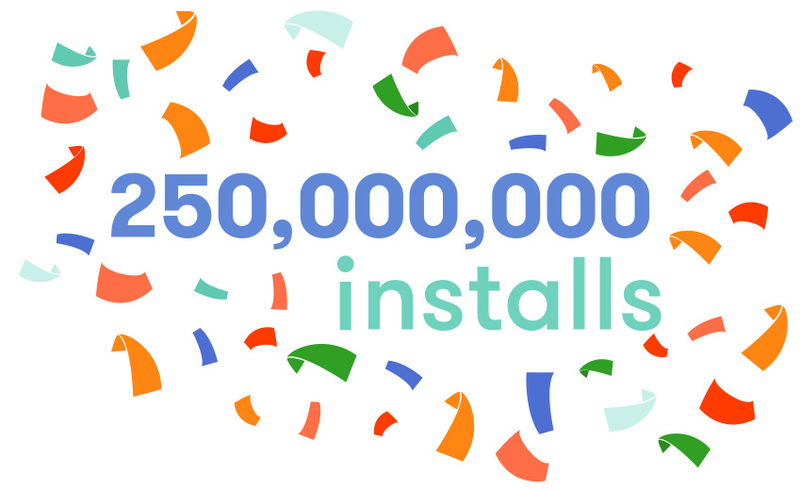 The Bible App has now been installed on a quarter of a billion unique devices. Many apps come and go. But thanks to you, the worldwide YouVersion community, the Bible App continues to thrive and grow. The Bible App was one of the first 200 apps in Apple’s app store debut, and still more people come to rely on the Bible App every day, all around the world. Together, this was our biggest year ever. Again. 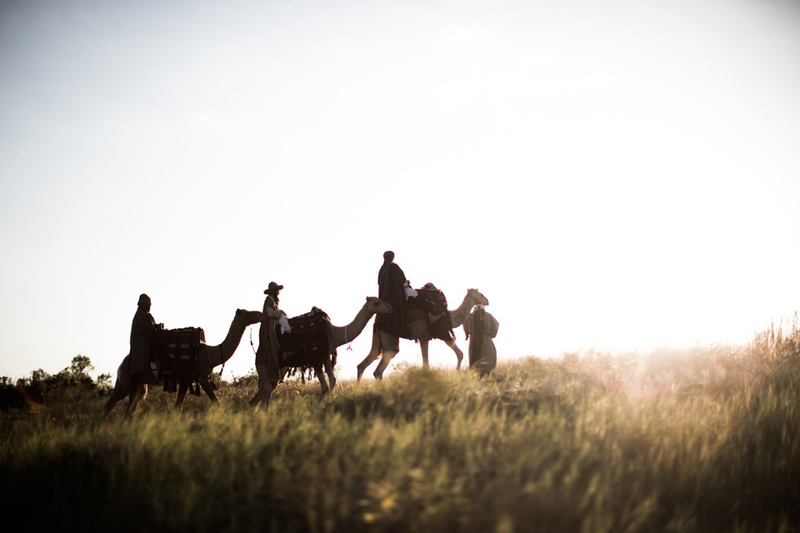 Thanks in large part to everyone who partners with us — visionary Bible publishers and societies, Bible translators, content providers, and hundreds of volunteers — we are privileged to be able to offer more opportunities for people to experience the Bible than ever before. In fact, in every category that we measure, the global YouVersion community has been more engaged with the Bible throughout 2016 than in any previous year. We now offer Bibles in 1,045 languages. While Cameroon’s highest usage is split between its official languages — French (50%), and English (47%) — Bibles in regional languages such as Fulfulde, Bulu, and Mandang are increasing in popularity. Although the Bible App features 26 Bibles in languages commonly spoken in Indonesia, our four Bahasa Indonesian language Bibles are the most popular. Usage for the most popular version, Indonesian New Translation, is almost evenly split between online and offline. Even as users continue engaging with Scripture in Portuguese (the official language of Mozambique) and in English, Bibles in Tsonga, Chichewa, and Sena are also seeing significant growth. Shortly after the Nepali New Revised Version and the New Testament in Eastern Tamang became available in the Bible App, users in Nepal began discovering them, prompting one of the most rapid increases in Bible reading in a heart language that we’ve ever seen. Bible App use in Tanzania is increasing, both in installs and in daily active use. Almost half of that use is offline. Usage of Swahili language Bibles increased during 2016, from 15% of total usage to 40%. Let’s celebrate our biggest year yet as a global community. Which verse was shared the most during 2016? What happens every second in the Bible App? How far would 250 million iPhone Pluses reach? Where in the world are people using the Bible App? Which verses were the most popular in other countries? What can you do to be a part of changing the world? Find out at our 250 Million Celebration website. What would happen if every person in the world who wanted a Bible could have one? We’re pouring our lives into equipping this generation to become the most Bible-engaged in history. And we’re inviting you to join us. When you give to YouVersion, you’re investing in bringing God’s kingdom and His will to earth, today. Take part in what God is doing in the world. Together, we could see this vision fulfilled in our lifetimes. 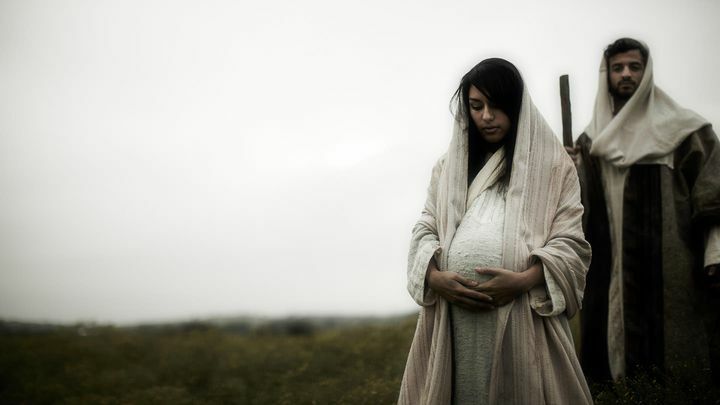 Help us spread the good news by sharing our celebration web page with your friends. YouVersion’s 250 Million Celebration is a terrific opportunity for you to introduce new people to the Bible App! 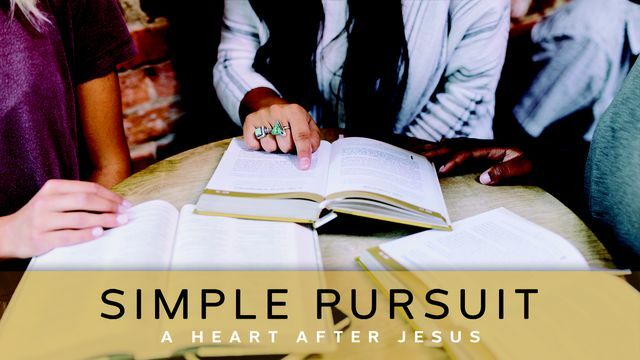 Developed by young people for young people, this short series of dynamic devotionals from the Passion generation captures the heart’s cry of believers who desire to live for God’s glory and fame. 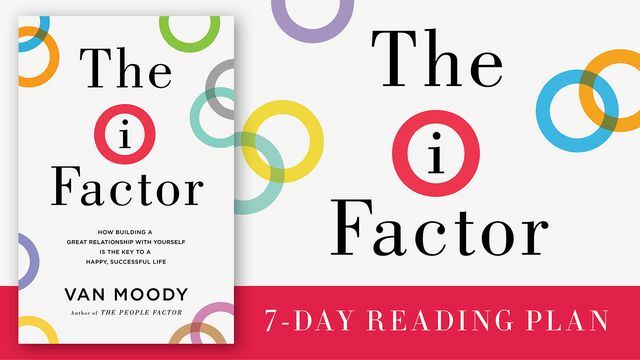 Through daily Scripture and excerpts from his book, The I-Factor, pastor Van Moody helps you acknowledge, assess, and address elements of your thought life and behavior that may be hindering you from fulfilling God’s plan for your life. 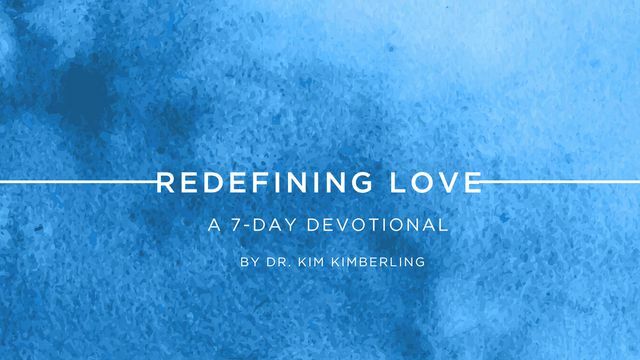 In this series of daily Bible readings and short videos, Christian marriage counselor Dr. Kim Kimberling teaches you how to love your spouse the way that God intends, ending each day with application questions that help you live out the things you’re learning.